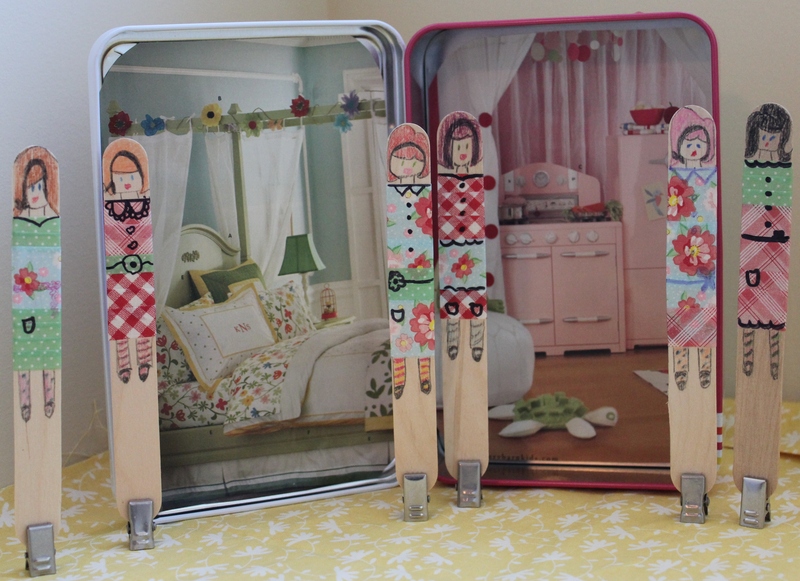 Homemade Gifts Part 1- Retro stick girls! I started this project because I wanted to make something homemade for Nora for Christmas. It was inexpensive, easy and fun…I do believe she’ll have fun playing with these and they make for an easy on-the-go toy as they have their own carrying case! All it takes to make them is popsicle sticks, markers/colored pencils, and washi tape! I wanted these to stand up so Nora could play with them in her doll house,the one she’s been asking Santa for, so I used those little hanging paper clips! *I did cut & remove the hanger first! The fact that I had to buy and eat a box of cookies to make the girl’s their storage tin was just a bonus! *I decorated the inside of the tin by gluing pages from a Pottery Barn magazine! As cute as these are, the next post just might be cuter! Girls are so much fun! Previous postHow Thanksgiving really came to be!